The state’s “Auditor General," Eugene DePasquale, attacks an agency called the Bureau of Hearings and Appeals – for holding hearings and ruling on appeals. He even suggests there's something nefarious in the agency's choice of name. It’s always risky to say that a particular politician’s claims about child welfare set a record for foolishness, but a bizarre rant by Pennsylvania Auditor General Eugene DePasquale about a division of the state Department of Human Services (DHS) is a contender. It isn’t just that DePasquale’s statements are weird. Worse, those statements endanger the children I’m sure he genuinely wants to protect. It isn’t. And DePasquale’s ill-informed fear-mongering only adds to the climate of hysteria that surrounds child welfare in Pennsylvania. That leads to overloading the system with false reports, trivial cases and cases in which family poverty is confused with neglect. And that overloads workers so they have less time to find children in real danger. Anyone who wants to know what the BHA is and what it does can find it on the internet, right here. And if you search for “Bureau of Hearings and Appeals” you’ll also find lots and lots of similar divisions of government agencies all over the country. Administrative tribunals are a routine part of American law – not some nefarious secret creation of one agency in Pennsylvania. 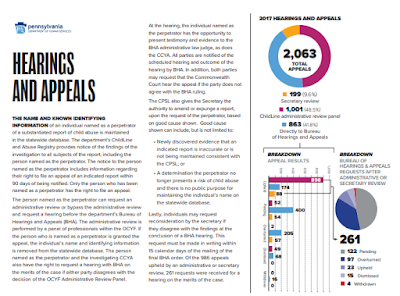 Hearings and Appeals" into a search engine. 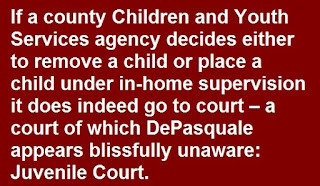 In the case of that one agency in Pennsylvania, however, the Bureau of Hearings and Appeals holds hearings and rules on appeals involving many situations, including a narrow subset of decisions by caseworkers for county child protective services agencies, usually known in Pennsylvania as Children and Youth Services (CYS) agencies. But BHA has no jurisdiction over the decisions DePasquale seems to think they have jurisdiction over. There are two problems with this: The four percent figure is contradicted by readily available data, and BHA decisions have no bearing on whether children are removed from or returned to their homes. Caseworkers for CYS agencies investigate allegations of abuse and neglect and then make a series of decisions including whether the family should be put under some kind of agency supervision and whether children should be taken from their parents. DePasquale seems to think these decisions can be appealed to the BHA. They can’t. He seems to think BHA can overturn these decisions and return children to their homes. It can’t. BHA has no role whatsoever in these decisions. Most people believe that once CYS has determined that someone abused a child, criminal charges automatically follow. In reality, only a small percentage of those cases result in criminal charges. Most of the time, this administrative court is as far as it gets. 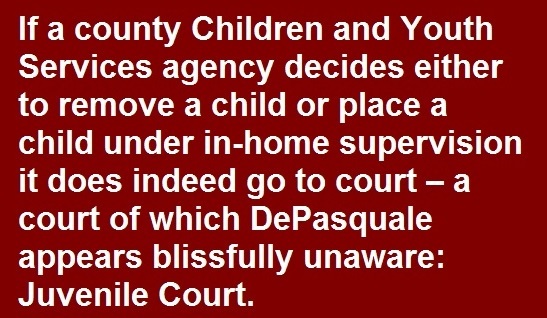 If CYS decides either to remove a child or place a child under in-home supervision it does indeed go to court – a court of which DePasquale appears blissfully unaware: Juvenile Court (sometimes called Family Court). These courts, not BHA, decide whether or not CYS should be allowed to take away a child (or if caseworkers already have done it on their own authority, whether to continue placement). These courts, not BHA, decide whether the child will ever go home again. The real problem with these courts, all over the country, is their tendency to rubber-stamp child protective services agency decisions, not overturn them. As a practical matter, the decision almost always rests with the CYS agency. Few cases also go to criminal court because typical cases are nothing like the horror stories. Far more common are cases in which family poverty is confused with neglect. And the fact that these juvenile court cases are handled as civil, not criminal matters, actually gives more power to CYS agencies. That’s because in these courts the protections for the accused in criminal cases don’t apply. In criminal court, for example, the accused must be guilty beyond a reasonable doubt. But in juvenile court a child can be torn from her or his family and consigned to the chaos of foster care if CYS shows only that it is slightly more likely than not that abuse or neglect occurred. If DePasquale really wants to apply criminal court standards of proof to all these cases, that’s fine with me. The number of children torn from their homes would plummet. As for BHA, it’s much more limited role involves only one, separate decision made by CYS workers: whether to check a box on the form declaring the allegation “indicated” or “unfounded.” This is something CYS workers and supervisors do on their own authority, with no chance for the family to defend itself in front of a neutral arbiter beforehand. The consequences of checking the “indicated” box are severe. The accused is listed in a statewide blacklist and, as a practical matter, barred from professions that involve working with children. Often it then becomes that much harder for impoverished Pennsylvanians to earn a living, increasing the poverty that may have been confused with “neglect” in the first place. (And, if the family happens to live in Allegheny County, the consequences can be worse.) This is why federal law requires all states to have some sort of process to appeal these findings. This is the one and only place where BHA gets involved in child welfare. They can overturn the decision to check the “substantiated” box. But a majority of the time, they don’t. 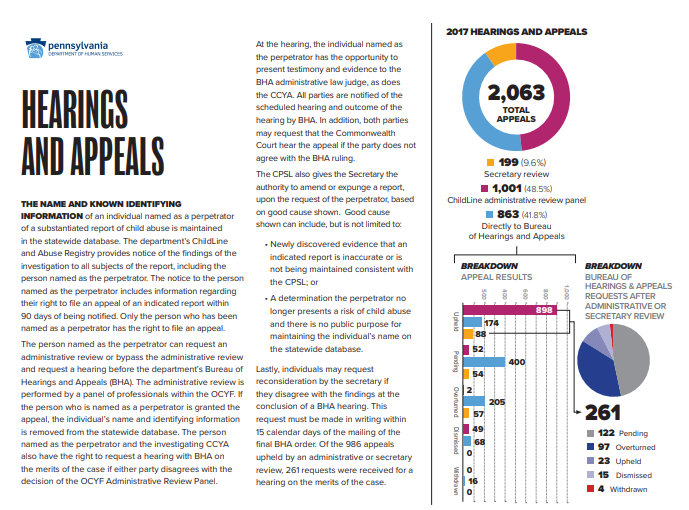 I have no idea where DePasquale got his four percent figure – and apparently neither does the Department of Human Services, which tactfully declared that it "looks forward to better understanding the data referenced.” As DHS points out, state data, presented in easy-to-read graphics on page 20 of this report, show that caseworker decisions are upheld in the majority of cases. guide to what the BHA is and the results of its decisions on Page 20 of this report. But though caseworker decisions are not overturned 96 percent of the time, as DePasquale suggests, they are overturned about 46 percent of the time. That is, indeed, alarming – but not in the way DePasquale thinks. 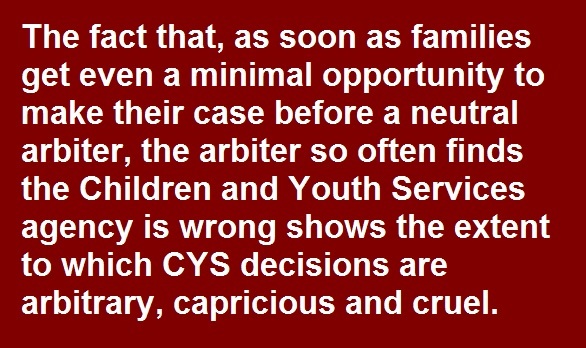 The fact that as soon as families get even a minimal opportunity to make their case before a neutral arbiter, the arbiter so often finds CYS is wrong shows the extent to which CYS decisions are arbitrary, capricious and cruel. That should come as no surprise to DePasquale. 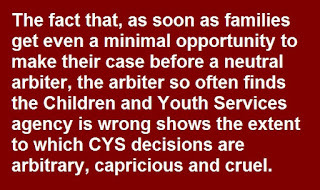 He has himself expressed alarm at the inexperience, overload, and high turnover among CYS caseworkers. Since these are precisely the conditions most likely to lead to errors in all directions, DePasquale should be leading the charge for a strong appeals process. But he’s not. I suppose that’s one possibility. Or maybe, just maybe, it’s called the Bureau of Hearings and Appeals because it holds hearings and decides appeals. the denial, suspension, termination, or reduction of any DHS-issued benefit (Cash Assistance; Medical Assistance; Supplemental Nutrition Assistance Program (SNAP) benefits, formerly known as Food Stamps; social services; durable equipment; etc.). those appealing decisions by the state Department of Aging – BHA handles those, too. Of course, if DePasquale would prefer a system in which the accused are not put on a blacklist of alleged child abusers without an actual court conviction first, I would be glad to support such an approach. Indeed, some Pennsylvania appellate judges have expressed qualms about Pennsylvania’s blacklist-first-ask-questions-later approach. I also have a more modest proposal: Next time, Mr. DePasquale, try doing the investigating first and then holding the news conference.